March 5, 2017 HockeyDraft.caLeave a Comment on Is This Finally the Year for the Washington Capitals? 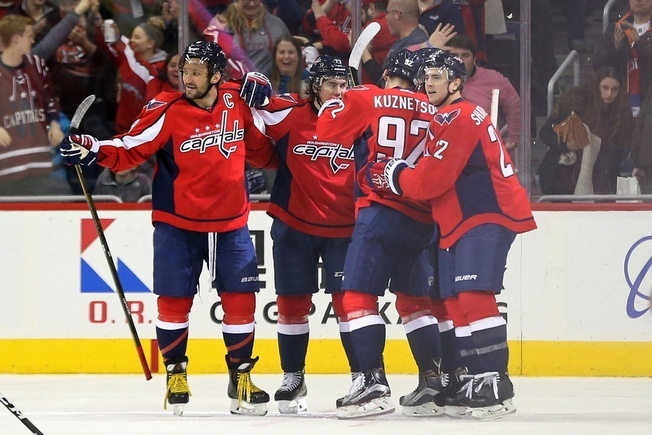 Is This Finally the Year for the Washington Capitals? After knocking off the Philadelphia Flyers on Saturday night, the Washington Capitals have won 15 straight games at home. That improves their record to 27-5-1 at the Verizon Center. They haven’t lost a game at home since a shootout loss to New Jersey on December 27 and haven’t lost a home game in regulation since dropping a 2-1 decision to Montreal on December 17. What’s more, the Capitals have outscored the opposition 67-21 during the streak. Washington has scored 210 goals this season and has allowed just 135 goals against, giving them the widest goal differential in the NHL. The Minnesota Wild are second in the category, having scored 209 goals as of press time and having allowed 148 goals against. The Capitals are 7-2-1 over their last 10 games, but they’ve gone 31-6-4 since December 5 and have managed a point in 27 of their last 31 games. With Washington surging in all the right places and at just the right time, it’s no wonder this incarnation of the club has been a heavy favourite to win it all. And indeed, these Capitals look almost impossible to beat right now. Goalie Braden Holtby was named the NHL’s Third Star of the month for February after posting an 8-0-1 record, with a 1.88 goals against average and a .928 save percentage. He allowed two or fewer goals in six of his last nine appearances, including his 30th career shutout on February 7. The 27-year-old netminder is 34-8-5 overall this season, with a 1.89 goals against average and a .931 save percentage. Oh, and he’s posted eight shutouts. Nicklas Backstrom is on top in points, with 65 in 64 games. He has 20 goals and 45 assists, including 25 points on the power play. Alex Ovechkin has 55 points in 64 games, including 27 goals – a dozen of which have come on the power play. The Capitals have 10 players in double-digits with respect to goals. Backstrom, Marcus Johansson, T.J. Oshie, and Ovechkin all have at least 20 points. There are issues to suggest that Washington will have trouble holding this exact roster together for more than one run, however, and that may be fuelling the sense of urgency around the franchise. After all, the Capitals only traded for defenceman Kevin Shattenkirk at the deadline because they could have him as a rental. They have 10 players on the current roster in need of new contracts, with Oshie and defenceman Karl Alzner among the biggest UFA names. Evgeny Kuznetsov is among the pending RFAs, with many signs pointing to a possible long-term reward for the 24-year-old Russian. With these pieces in place and the added bonus of urgency in their back pocket, is this finally the year for the Washington Capitals? It’s certainly possible, but there are all sorts of variables in the post-season. The team is playing like a well-oiled machine and they’re receiving some of the best goaltending in the NHL, which helps provide balance and ensures that there’s more than offensive prowess behind Washington’s current success. And if goaltending really wins championships, this really could be the year indeed.